A hacker released the source code for antivirus firm Symantec’s pcAnywhere utility on Tuesday, raising fears that others could find security holes in the product and attempt takeovers of customer computers. The email thread was published on Monday, but the hacker and the company said their participation had been a ruse. YamaTough said he was always going to publish the code, while Symantec said law enforcement had been directing its side of the talks. The negotiations also might have bought Symantec time while it issued fixes to the pcAnywhere program, which allows customers to access their desktop machines from another location. “Symantec was prepared for the code to be posted at some point and has developed and distributed a series of patches since January 23 to protect our users against known vulnerabilities,” said company spokesman Cris Paden. Symantec had taken the extraordinary step of asking customers to stop using the software temporarily until it readied the patches. It issued fixes for “known vulnerabilities” in version 12.5 of the software on January 23 and fixes for versions 12.0 and 12.1 on Friday January 27. 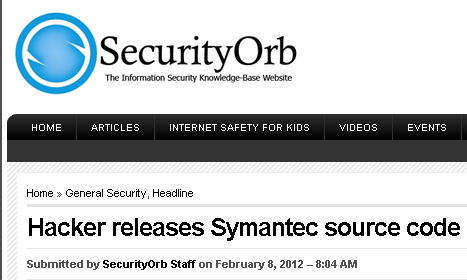 Paden said that Symantec had contacted its customers and that it had not lost any customers. He said that if they were running up-to-date, patched versions they should not face increased risk. Symantec also expects hackers to release other source code in their possession, 2006 versions of Norton Antivirus Corporate Edition and Norton Internet Security. “As we have already stated publicly, this is old code, and Symantec and Norton customers will not be at an increased risk as a result of any disclosure,” Paden said. The emails over the $50,000 payoff was widely circulated, with some mocking the world’s largest standalone security company for its apparent attempt to buy protection. But the company said the emails were in fact between the hacker and law enforcement officials posing as a Symantec employee. “The communications with the person(s) attempting to extort the payment from Symantec were part of the law enforcement investigation,” Paden said, adding that no money was paid. Paden declined to name the law enforcement agency, saying it could compromise the investigation. Symantec had previously confirmed the hacker, part of a group called Lords of Dharmaraja and affiliated with Anonymous, was in possession of source code for its products, obtained in a 2006 breach of the company’s networks. The email exchange released by the hacker, who claims to be based in Mumbai, India, shows drawn-out negotiations with a purported Symantec employee starting on January 18. The email negotiations echoed conversations in past years, viewed by Reuters, in which police agencies directed talks between victims and hackers. “We can’t pay you $50,000 at once for the reasons we discussed previously,” said one email from a purported Symantec employee Sam Thomas, who offered to pay the full amount at a later date. A common tactic of the FBI and others investigating extortionists and kidnappers is to seek to break down the amount of money sought by the suspects into multiple smaller payments. This stretches out the negotiation, giving authorities more insight into the suspect and more time in which to make an arrest. It also lessens the risk to any victim inclined to pay the entire amount demanded. Most important, it creates more transactions, each one of which provides a trail of records and human beings that can be traced as the police seek their quarry. The hacker said he never intended to take the money. “We tricked them into offering us a bribe so we could humiliate them,” YamaTough told Reuters. In recent weeks, the hacker has posted segments of code for Norton Utilities and other programs. A software maker’s intellectual property, specifically its source code, is its most precious asset. Symantec’s Norton Internet Security is among the most popular software available to stop viruses, spyware, and online identity theft.